SCHREIBER, CONCHAR & WESTPHAL CO.
All of the companies specifically named in this article also offered axes under different labels and brands. (The F.O.E. being a fraternal organization, is not included in that group.) It is our intention to publish articles in the future that will discuss any of those companies further and show other markings and/or labels that they were associated with. We also plan to publish articles of a similar nature dealing with numerous other manufacturers and distributors. What has long been known as the LINCOLN AXE holds a reputation by axe collectors as being one of the most desirable examples to own. In addition to including an interesting etching, a very desirable quality of such a collectible axe is that it be close to or actually in pristine condition. A demanding attribute when one considers these axes were probably discontinued sometime in the 1930s. Considering they were first introduced in the mid 1890s, they were distributed for less than fifty years. Another consideration relates to specifically what markings are on the axe. That may or may not dissuade a collector from acquiring such an axe and it may be a lesser consideration in comparison to condition, but when one realizes that there were numerous of markings for Lincoln axes the collector’s challenge expands. The existence of the Lincoln Axe has raised a number of interesting questions. It would also be more accurate to say the Lincoln Axe has also resulted in some interesting but sometimes inaccurate conclusions. 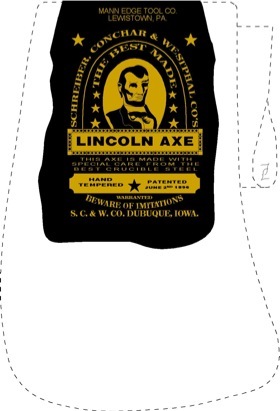 There are some individuals that think that some Lincoln axes were actually made in Dubuque, Iowa. That has not been documented and is believed to be totally incorrect. There are also those that think there was actually a Lincoln Axe Mfg. Co. That name was used on some labels but that so-called company was actually a misleading name used by a manufacture to facilitate axe distribution. In order to better understand the beginnings and evolution of the Lincoln Axe it may be helpful to know a bit about the beginnings of the Schreiber, Conchar & Westphal Co. and the Mann Edge Tool Co. The reader should note that the Schreiber, Conchar & Westphal Co. and the Mann Edge Tool Co. were established around the same time. All things considered, that suggests there may have been advantages for both companies to work together at the time. It may also be noted that the principals in both companies were not new to their respective business enterprises. The SCHREIBER, CONCHAR & WESTPHAL CO.
Schreiber, Conchar & Westphal Co. was established when two already existing companies combined. One was named The Schreiber & Conchar Mfg. Co. and the other named the Westphal-Hinds Hardware Co. The Westphal-Hinds Hdw. Co. had been established in 1855 when William Westphal formed a partnership with a man named Hinds who had started in the hardware business in 1853. William Westphal is believed to have had ties to the Novelty Iron Works Co. and the Norwegian Plow Co. which probably stimulated his connections with similar enterprises. William Westphal died in 1869 but his wife and his estate continued to be involved with the Westphal-Hinds Hdw. Co. for quite some time; at least up until the establishment of the Schreiber, Conchar & Westphal Co. The Schreiber & Conchar Mfg. Co. had been incorporated in 1888. According to their letterhead they engaged in various forms of foundry work and metal finishing. They advertised that they did nickel and bronze plating as well as Japanning. In 1893 Schreiber & Conchar entered into an agreement with Westphal-Hinds that resulted in the establishment of the Schreiber, Conchar & Westphal Co. The new company was classified as a wholesale hardware concern and at that time the Schreiber & Conchar Mfg. Co. continued to operate under its own name. Subsequent letters between Schreiber, Conchar & Westphal and the Mann Edge Tool Co. suggest that the Schreiber & Conchar Mfg. Co. eventually became a subdivision of the Schreiber, Conchar & Westphal Co. The MANN EDGE TOOL CO. The Mann Edge Tool Co. was formed after Joseph Mann, a previously well-known axe manufacturer, withdrew from the American Axe & Tool Co. The A. A. & T. Co. had been formed in 1889 and Joseph was one of the individuals involved early in the management of the A. A. & T. Co. He rapidly became dissatisfied and within a few years he withdrew from what had become known as “The Axe Trust.”. By 1893 Joseph, along with a few other businessmen, had reestablished an axe factory near Lewistown, PA. They could not use any of the company names that had previously been used for any of the Mann companies so they organized as the Mann Edge Tool Co. The original Lincoln axes, even before those with the etching of Lincoln along with the name of the wholesaler, were made by the Mann Edge Tool Co. of Lewistown, PA. The earliest versions were ordered in the mid 1890s, possibly 1894, and it is believed that the orders were initially placed through a manufacturers agent. That agent was Robert Mann, Jr. who maintained offices in Minneapolis, Minnesota. Robert Mann, Jr. was a younger brother of Joseph R. Mann, the founder of the Mann Edge Tool Co. Robert, Jr. had previously been active in axe making but apparently was excluded when the various Mann axe-making companies, along with some of the Manns themselves, got involved with the American Axe & Tool Co.
By the mid 1890s Robert Mann, Jr. maintained an office at 235 Syndicate Block in Minneapolis. His letterhead indicated he was operating as a Manufacturers Agent. The overall extent of his representation as an agent is unknown but it may have been restricted primarily to selling Mann edge tools. His letterheads also included a cut of an axe head that included the MANN’S SPECIAL AXE label. Indications are that Robert, Jr. was responsible for a territory that encompassed either all of or parts of Iowa, Nebraska, Minnesota and Wisconsin. It is quite probable that Robert, Jr. initially arranged for the sale of axes to the Schreiber, Conchar & Westphal Co. That company had been established in 1893 as a wholesale hardware dealer in Dubuque, IA. Reports also indicate that Robert Jr. was actually the secretary of the Mann Edge Tool Co. when it was established in 1895. It is possible that he held more than one position at the same time but that remains to be clarified. It was not uncommon at the time for principals in axe companies to participate on sales trips but in this case, Robert, Jr. may have relocated because of what was described as health reasons. Before discussing the variations of Lincoln Axe markings, the reader may find it interesting to learn that the Mann Edge Tool Co. had other dealings with the Schreiber, Conchar & Westphal Co. Perhaps those dealings have contributed to the misunderstandings about Schreiber, Conchar & Westphal Co. being axe manufacturers themselves. During the years that the Schreiber, Conchar & Westphal Co. was operating they were involved in some other business transactions with the Mann Edge Tool Co. One such transaction was in the form of nickel-plating of axes. Indications are that the Mann Edge Tool Co. was investigating the etching of nickel-plated axe heads. The Schreiber & Conchar Mfg. Co. did that type of work and the two companies made an agreement to see if the processing was a viable activity. The Schreiber & Conchar Mfg. Co. was involved in the establishment of the wholesaling company and later became a division of the parent company Schreiber, Conchar & Westphal. From the correspondence reviewed it appears that all did not go as smoothly as hoped. That analysis is based on copies of communications from Schreiber, Conchar & Westphal as well as the Schreiber & Conchar Mfg. Co. to the Mann Edge Tool Co. The final resolution of the matter has yet to be determined but based on the lack of nickel-plated axe heads it appears that things did not work out as planned. However, the relationship does raise a question. Were the tests conducted with the intention of ultimately manufacturing nickel-plated Lincoln Axes? There is no question about the first two etched designs being manufactured by the Mann Edge Tool Co. That has been validated with purchase orders and letters of correspondence as well as copies of design transfers used in connection with the etching process. It is believed the third and forth etched Lincoln Axes were made by another company. The fact that the reference to the Mann patent was eliminated from the Tredway & Sons axe heads is one indicator of the change. The difference in Lincoln's head is another. This may have been the case until the Schreiber, Conchar & Westphal Co. was acquired by A. Tredway in 1904. After that the identity of the actual supplier becomes a bit cloudy. It relies more on analysis of available data as well as clues. Before going into that, a question concerning the use of the company names A. Tredway Hardware Co. and A. Tredway & Sons should be addressed. Shortly after A. Tredway Hdw. Co. acquired the Schreiber, Conchar & Westphal Co. there may have been an operating name change to A. Tredway & Sons. The legal name change may not have occurred until 1907. This statement is based on the observation that there are no Lincoln Axes known that were marked A. Tredway Hdw. Co., yet there are many examples with the name A. Tredway & Sons. Could it be that axes bearing the Schreiber, Conchar & Westphal Co. name were marketed until 1907? That is quite doubtful. The company, legally known as A. Tredway & Sons, operated the concern from 1907 through 1925. They then merged with the Kretschmer Mfg. Co. to form the Kretschmer-Tredway Co. The Kretschmer Mfg. Co. had been founded in 1907. The company continued in business until 1985 but reportedly significant changes in their operations occurred around 1939. It is believed that the breakout of World War II resulted in the scarcity of strategic materials, which resulted in the discontinuance of many hardware and tool items, including axes. That would have brought the era of the true Lincoln Axes to an end. There are six different etchings that are known to have been used in conjunction with what is referred to as the true Lincoln Axe. Based on the letter, it is believed that the earliest lots of Lincoln axes included a paper label rather than an etching but obviously etchings were also used. As of this writing no such paper label has been observed. 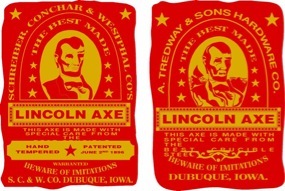 Could this have been the shape of the early paper labels used on Lincoln Axes by the Schreiber, Conchar & Westphal Co.? The third & forth designs are believed to have been manufactured by the Kelly Axe Mfg. Co. of Charleston, W. VA. The change probably occurred around 1905 or 1906. The Kelly Mfg. Co. was at the time a major manufacturer who made etched axes under some of their own brands as well as under brands directly associated with wholesale distributors. In addition to what can be called the true Lincoln Axes, hatchets have been observed with Lincoln’s head within a circle and next to the name LINCOLN AXE. The hatchet appears to be one of the designs made by the Kelly Axe Mfg. Co of Charleston, W, VA. 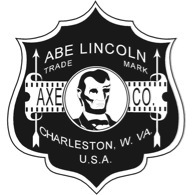 Eventually a label was observed that includes a depiction of Lincoln's head, the words "ABE LINCOLN AXE CO." and a location of Charleston, W. VA. 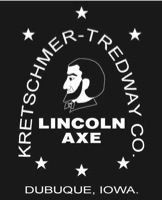 Referring back to the third and forth true Lincoln Axe, the time frame within which they were made can be compared to the years that the Tredways sold Lincoln Axes, 1904 until 1927, and when Kretschmer-Tredway sold Lincoln Axe, 1927 until approximately 1940. There was another change in manufacturer during that time because the American Fork & Hoe Co. acquired the Kelly Axe Mfg. Co. in 1931. That led to a change in the etching design applied to Lincoln Axes but the exact date is unknown. When the American Fork & Hoe Co. took over the Kelly Mfg. Co. manufactory in Charleston, W. VA. they commenced operations using the name Kelly Axe & Tool Works. In some cases the name was used together with the name of the American Fork & Hoe Co. In other cases it was shortened to just Kelly Works. Gradually the name was changed until almost everything they identified as their own included the wording TRUE TEMPER. Those products that they manufactured for wholesale distributors often included only the name of the wholesaler, such as Kretschmer-Tredway. The Kelly Axe & Tool Works did make some axes with etchings and example of which is the BLACK RAVEN. That was almost a direct carryover from when the Kelly Axe Mfg. Co. made the Black Raven and reinforces the fact that they continued to manufacture axes with etched designs. After the American Fork & Hoe Co. started manufacturing the Lincoln Axe, the new etching became considerably simpler. Lincoln’s head was no longer facing right but was a full left profile. The same design was also used on a paper label. 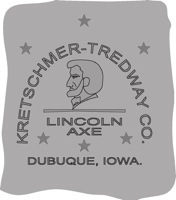 The distributor’s name continued to be Kretschmer-Tredway Co. as depicted in the representation of the etching and the facsimile of the paper label, both of which have been observed on actual axe heads. What is believed to have been the last etching used on true Lincoln Axes appears to be one of the scarcest designs to find. It may be that it was adopted in the late 1930s but soon fell victim to the major cutbacks of manufactured goods. Axes were made of steel and steel was a strategic war material. It is ironic that while many of the tools of the day were being discontinued as manufactured goods similar artifacts of yesteryear were being gathered together for recycling so the material could be reused. Compounding the situation was the decline in available fuel oil so heating units were converted to be able to burn coal and/or wood. The demand for axes increased but the supply diminished. Another interesting observation is the existence of some axes with an etching quite similar to the Lincoln face included on the forth true Lincoln Axe. It was used by itself on one face of the axe while on the reverse face the name KELLY WORKS appeared. Such axes may have been distributed in a similar fashion, without a specific wholesaler's name, to those previously made by the Kelly Axe Mfg. Co.
Another Lincoln related chopping tool identifier was a paper label that included the brand OLD ABE’S RAILSPLITTER. Axes bearing the Old Abe’s Railsplitter label were sold through hardware stores in the early 1900s and are not considered Lincoln axes. They are mentioned here as a point of clarification. They were made by the Mann Edge Tool Co. of Lewistown, PA.
As a point of clarification, when collectors refer to true Lincoln Axes they are referring to those Lincoln Axes that were associated with the original wholesale distributors; the Schreiber, Conchar & Westphal Co. and their successors, A. Tredway & Sons and then Kretschmer-Tredway. 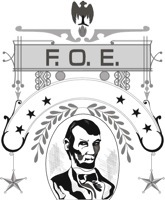 Another chopping tool included an etching of Lincoln’s head in addition to some elaborate line-work, a small eagle and the initials F. O. E. The reverse side of the axe head includes an etching of a building. The example in question is believed to have been made in Beavers Falls, PA. at the time that The American Axe & Tool Co. operated a manufactory there but the face design raises questions concerning the maker. The face is very similar to that which appeared on the first two etched versions of the Lincoln Axe. That suggests that the axe head may have been made by the Mann Edge Tool Co. It is further believed that the initials stand for Fraternal Order of the Eagle but that is unconfirmed. Such an elaborately decorated axe is not considered a true Lincoln Axe. Without question there is some degree of conjecture included in this article. It is partially based on information included in correspondence reviewed as part of the remaining Mann Edge Tool Co. papers. Certain inferences have also been drawn from or influenced by observations of artifacts, pictures of artifacts and correspondence with knowledgeable historians and individuals. There is no question about the first two etched designs being manufactured by the Mann Edge Tool Co. That has been validated by reviewing purchase orders and letters of correspondence as well as copies of design transfers used in connection with the etching process. It is believed the third and forth etched Lincoln Axes were made by another company. The fact that the reference to the Mann patent was eliminated from the Tredway & Sons axe heads is one indicator of the change. The difference in Lincoln's head is another. A Lincoln Axe head finished in red Japanning with gold in-fill has been reported. It may have been a special order as only one such example is currently known extant. A this point the details of the markings are unknown. Does it include the patent notation? What company name is included? Embossing reported to have been used on some axes made for a fraternal organization in Beaver Falls, PA.
Facsimile of a paper label that was used on some axes made by the Mann Edge Tool Co.
Facsimile of a paper label that was used on some hatchets made by the Kelly Axe & Tool Works, also known as the Kelly Works. Those names were used to designate the axe making division of the American Fork & Hoe. Co. Marking observed on some hatchets made by the Kelly Axe Mfg. Co. Representation of the sixth etching used on Lincoln Axes. Indications are that the design is quite scarce and was probably the last etched design used before the Kretschmer-Tredway Lincoln Axe was discontinued. Representation of a design that was etched into one face of some axes while the wording was stamped into the opposite face. The actual maker was the Kelly Axe and Tool Works, a division of the America Fork & Hoe Co. Representation of the first Lincoln Axe etching used by the Schreiber, Conchar & Westphal Company. This drawing is a representation of the second etching that was used on LINCOLN AXES sold by Schreiber, Conchar & Westphal. Note the stamping of the manufacturer's name above the design. Such additional markings were not used on all Lincoln axes. Also note the apostrophe used in the abbreviation for Company's in the large arched name, indicating the name belonged to the Schreiber, Conchar & Westphal Co. The outline and design segment are meant to depict general proportions. The actual size of such an axe head may have been approximately 4 1/2" x 7", or a bit smaller or larger depending on the weight of the head. Lincoln Axes with a simplified design were manufactured with etchings and identified with similar labels. The dates are unresolved but believed to have been in the 1930s. This was the fifth etching known design used. 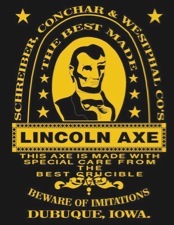 NOTE: There was no company named the LINCOLN AXE CO. LINCOLN AXE was a brand created by SCHREIBER, CONCHAR & WESTPHAL CO. The brand was acquired and continued by A. Tredway Hardware Co. They became A. TREDWAY & SONS and then the company became the KRETSCHMER-TREDWAY Hardware Co. Etched axes with the LINCOLN AXE name were made by the Mann Edge Tool Company until sometime in the 1930s. Cross reference articles published on the YesteryearsTools web site that relate to this article; Schreiber, Conchar & Westphal and the Tredway Hardware companies. This company will be included in the MANN AXE MAKING DYNASTY booklet.